Bulova 1970 Accutron Astronaut "Mark II A"
One of my favorite styles, this is an all stainless steel case with black dial and the 2185 movement. Case is SS and dated M9, case number 2991. Black dial with red accents. Movement is USA made 2185, N0 datecode, added a nice leather strap. Model is almost identical to the 'E' variant, one difference being the home indicator uses a red hand instead of the window above the 6. That is a real beauty. Ads and face say it all. 1970 Bulova Accutron Astronaut Mark II "A"
Wonderful find! Great condition, congrats. Very very nice. Would love to own one of these one day (when I win the lotto). There is a small difference between your's and the one shown in the advert. 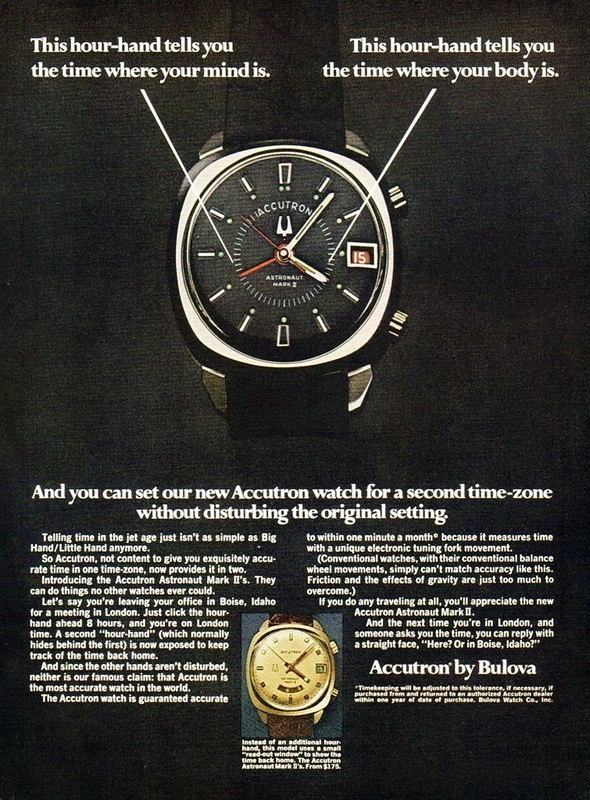 The adverts has the date of 27, yours shows 19.....tentative Accutron Astronaunt Mark II "A"
All 1970 Accutron Astronaunt Mark II "A"
Okay, good eye on that. There seems to be a few different consistent hand placements amongst the adverts, but I never noticed the date. Out of curiosity, I went back through some Accutron ads and the 19th is by far the most common, next common is the 15th; day wheels typically seem to be Saturday. You did a nice job on this one Ken. I think this is my favorite of the Astronaut watches, the stainless with black is cool and the red accents really completes the package. I bet you'll wear this one for a while?